This game is a legend for many reasons it was the first mario bros,made Nintendo what it is today,and has sold over 40 million copies in a mere 20 years. This game is your classic mario game your goal is to get to the flagpole at the end of the level. 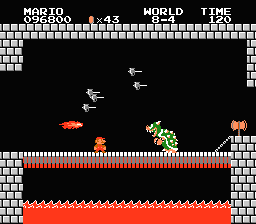 In your way are koopa's,goomba's,and paratroopa's.There are 8 different worlds in this game each getting increasingly difficult then that last and with no way to save you better collect 100 coins to gain a extra life cause you going to need it.At the end of the world you fight bowser or at this time king koopa,to kill him is easy you merely get to the other side and hit the switch but you soon find out after you beat world one that instead of princess toadstool you find a toad saying that she's in a different castle. This game's visual's are old but there still nice for a nes game.Instead of bowser being a yellow and green pain, he's more of a green colored monster that shoot's fire ball's. The music in it is unforgettable the mario theme song is know to everyone even if you have never played mario before. Good review but remember, it may not be a good game if it came out today, but it came out in 1985. So i would give it a higher score.